It’s the season of giving and that means you’re probably looking to buy the perfect gift for all the important people in your life. Here’s a list of must-haves that any espionage buff is bound to love. The Last Goodnight: A World War II Story of Espionage, Adventure and Betrayal by Howard Blum—what better way to keep an espionage lover on his or her toes than a riveting biography of a dazzling American debutante who became an Allied spy during WWII? 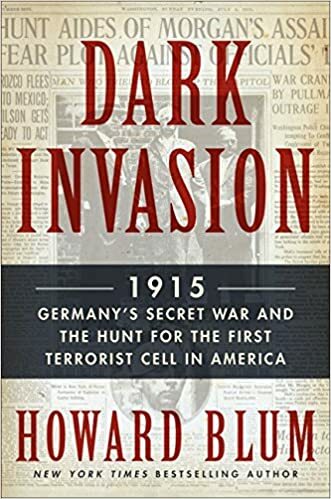 Dark Invasion by Howard Blum—a gritty, high-energy true-life tale of German espionage and terror on American soil during World War I, and the NYPD Inspector who helped uncover the plot—the basis for the film to be produced by and starring Bradley Cooper. James Bond Ultimate Collector’s Set—a collection of all 21 James Bond films, from Dr. No to Casino Royale and another 21 discs full of bonus features; a set that any 007 fan would die for. An iSpyG1 Espionage Gum Stick Spy Cam Tiny Mini DVR + SD—what espionage adherent wouldn’t love the world’s smallest DVR that records up to 90 minutes of high-quality full color video and sound? Famous Assassinations in World History: An Encyclopedia—a book including the most up-to-date coverage of assassinations of key figures throughout history and around the world. A spy t-shirt—grab this customizable spy t-shirt (available in multiple colors) that any espionage lover is bound to adore. MI-6 Secret Service Logo Mug—this unique coffee mug is perfect for anyone who wants to feel like a spy as they sip their coffee or tea. The Spy Who Couldn’t Spell: A Dyslexic Traitor, an Unbreakable Code, and the FBI’s Hunt for America’s Stolen Secrets by Yudhijit Bhattacharjee— a thrilling novel based on real-life events about an FBI’s hunt for Brian Regan known as the Spy Who Couldn’t Spell. Bridge of Spies DVD—what can be better than a historical drama legal thriller film directed and co-produced by Steven Spielberg and starring Tom Hanks?